How often do you think, "What the heck do I get for this person?" Those were my thoughts when my nephew Kale was born. My sister-in-law Haley and my brother Conrad are the type of people who can buy anything they need, are particular about mother's day gift ideas, AND they're halfway across the country so I don't know what they already have. Someone suggested giving something like these gifts for grandma, but I wanted to do something a little more permanent. Finally, I had a burst of inspiration! This Mother's Day Bracelet (or mommy bracelet as they are commonly called) was the perfect gift for my sister in-law. A Mother's Day Bracelet (A.K.A. 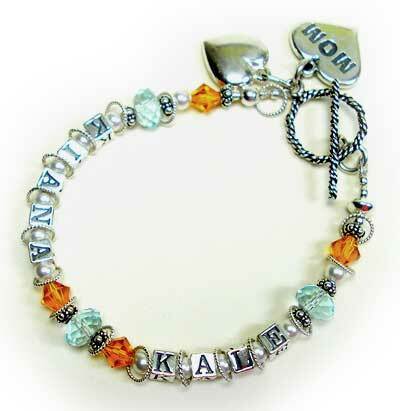 a Mommy Bracelet or Mother Name Bracelet) is gorgeous, sparkly, elegant, and special enough to become an heirloom. AND I can be sure it will never be regifted or returned! (Not that Haley would ever do anything like that, but the possibility nibbles away at my mind anyway). This crystal, silver, and gemstone bracelet is so lovely - I looove the silver rings. They kind of jingle jangle on the bracelet as you move around. These instructions are for a one-strand bracelet. You can see the instructions for a three strand bracelet here. Note about bead amounts - Depending on the children's names, and the size of the mommy's wrist, you may need more or fewer. Cut your nylon coated beading wire about 2.5 inches longer than the person's wrist size. Put a piece of masking tape, an alligator clip, or a bead stopper at the end of your stringing wire. Don't finish either end yet. String your beads onto your wire. It's OK to string and restring until you're happy with the design (I usually have to rearrange a few times until I like the look). 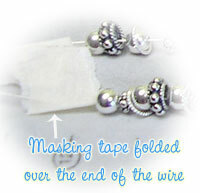 Put masking tape or a bead stopper on the open end of beading wire. Measure your strung beads. Make sure that they are all pushed together. Your string of beads needs to measure the same as your wrist measurement less about 1/8th of an inch. Add or remove beads from the ends as necessary. Call me paranoid, but I usually double or even triple crimp my bracelets to make extra sure they don't come apart. This bracelet is triple crimped on each end. Take your tape off one end and string a crimp tube, a sterling 6mm bead, and 2 more crimp tubes. Form a loop at the end of your bracelet by stringing a 1/2" piece of french wire onto your beading wire, then stringing your beading wire back through the 2 crimp tubes, the sterling round bead, and the 3rd crimp tube, and the next bead in line too. French Wire is a coil of very fine wire that fits over your beading wire. I use it on the toggle end. Tighten up everything nice and snug by pushing your beads and crimp tubes close together. Crimp each tube. Take the remaining piece of tape off your bracelet. 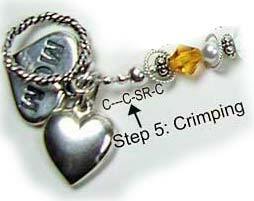 String 1 crimp tube, 1 sterling round, and your last 2 crimp tubes onto your unfinished bracelet end. String the clasp. 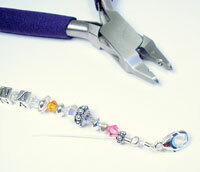 String the end of your beading wire back through the sterling bead and crimp tubes tighten the beading wire. I like to use my Magic Crimping pliers (to see what these pliers look like, see the lefthand pic below) because it turns my crimp tubes into little round balls that look like beads. You can use crimping pliers to crimp and fold the tube, or squash the crimp tubes flat with your pliers instead. Lefthand picture: This picture shows a different clasp, but I wanted to show you how your crimp tubes and beading wire should look in this step. Righthand picture: Legend: C=crimp tube, SR=sterling round (obviously, these tube are already crimped) See how my crimp tubes look like liitle beads? Your toggle bar usually has a jump ring attached to it. Use it to attach the toggle bar to your french wired loop. Step 7: Trim your nylon beading wire close with flush cutters. Admire your work, and wear it around town for a day to make sure it won't fall apart or fall off. Finally, if all is well, wrap it nicely in a pretty box for your lucky friend or mom. Don't forget to write a nice little card explaining what materials you used, and about the birthstone crystals. Brag a little! Make sure your gift recipient knows how much time and thought you put into the gift! Make matching mother and daughter bracelets. 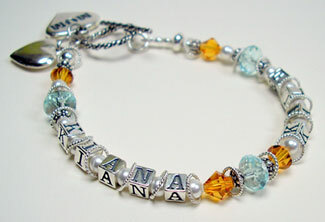 Make a Grandmother bracelet with "GRANDMA" in letter beads, and all the birthstone crystals of her grandchildren. Mommy bracelets make great gifts. Imagine giving one of these to your mom for Christmas or Mother's Day. Better yet, give one to a special new mom instead of a baby gift (especially if they already seem to have everything). 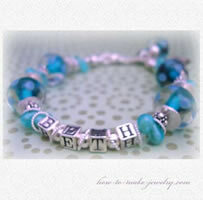 The Beth Bracelet: I made this bracelet for a friend - She gave it to her niece Beth as a University Graduation gift. The Ruby Bracelet: This gorgeous bracelet was for my friend Suzanne. I made it when she had her second child Ruby. The other name you can't see very well is Jack, her firstborn. Learn how to make a similar two-strand mommy bracelet here. Ps. If you want more selection for your charms, we've made a list of our favorite bracelet charms here.